I have had a look for some Scottish suppliers as I remember seeing someone who specialised in apples for the Scottish climate some time ago. I don't think this is the one I saw then, but it may be worth you checking out. It sounds like slow and steady is the best way with your challenging landscape and climate. Being that much further north than me will mean your weather is much more ferocious than anything I have to contend with. Our little place on the hill is at 1,000 feet, more or less on the contour line. It faces south and has the sun pretty much from morning to night. It also benefits from a hedge that provides wind protection and was planted by the previous owners who had a plant nursery here some years ago. That was all in greenhouses / polytunnels and pots so the ground is not prepared in any way. So, despite being high and potentially exposed, I think that this site is not too bad. It is certainly colder, windier and wetter than anywhere in the immediate vicinity that is downhill and that is most places as the River Severn and one of its tributaries run around the hill we are on. I have been growing berry and shrub bushes, perennial vegetables including yacon, oca, mashua, earth nut pea, dahlia, skirret, scorzonera, perennial kales, leaf beet, various onions such as tree onion, Welsh onion, shallots. Also some annuals carrots, parsnips, daikon radish, beans (runner, french, field), peas, herbs - annual and perennial, flowers like calendula, love in a mist, poppies of different types. I can't think of anything I have tried so far that did not grow, but there will be things I'm sure. Ooh yes, I lost the caucasian spinach and one of the honeyberries and some flowering honeysuckle, but perhaps just because I didn't look after them. The soil is clay with lots of stones and needs a lot of organic material. I only began the garden in spring of 2013. I have planted Welsh heritage fruit trees - trwyn mochyn apple, Denbigh plum, damson Abergwyngregyn and cariad Cherry, plus Sunset apple which likes Shropshire apparently (we are one mile from the border). So far it has been a veritable jungle of growth, but we had a mild winter last year and a warm sunny (but wet) summer, so there could be lots more testing times to come. Most of my veggies self-seed here. 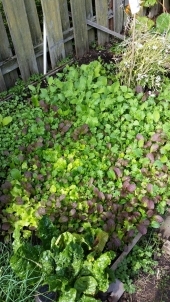 I love weeding extra growth of these non-weeds!!! 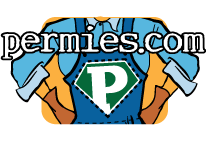 What is different in gardening with perenials? Yes Xisca - polyculture is an important way of growing. For me, in my own garden and with my own circumstances perennial vegetables have proved to be a way of growing food that works. Other people in different places, with different circumstances may well find other things work better for them. I don't think there has to be any dogma about it, just find out what suits you and your garden and do that. And yes, perennials can be hard to find. What works and what doesn't work? It is so encouraging to read all these posts and know that there is such a creative community of permaculturists 'out there' and to see that it is nature that is doing so much of the teaching. Anyway I ask, having read what Patrick wrote if using shade and not letting some annuals seed if you think it maybe possible to perennialise annuals a part from brassicas. I'll try to push this possibility on my land. I hope to be able to give some news in future writing to you. I'm really not sure, but it's always good to experiment. Nice photo Dale, I love all those free plants! I like Blythe Barbo's comments. I did try to create a spreadsheet some years ago, as I tend to be a bit that way inclined (actually I love spreadsheets!) but it was not really necessary for the scale of my garden. I have kale sprouting up here and there all over, and it does much better if I just let it do its own thing. If it’s interfering with something else, I eat it. I use the edges of the guilds and some of the gaps waiting for the perennials to size up as areas in which to plant annuals, which demand more attention, sun, water, and nutrients, but are temporary placeholders. When something sprouts up unexpectedly, I try to respect its choice, because I figure nature knows better than I do. The annuals have a need to grow fast, produce seed, and die before the season ends; perennials are more likely to take their time, bloom earlier or later, reach deeper for water, have extended harvests. In late summer, the abundance is amazing! I pick what I can, offer some to friends and the local food bank, and leave the rest for wildlife. I no longer stress over picking every berry. I like this bit particularly, especially about nature knowing best. Some say my garden is total chaos. I say it’s “working.” What works or not is really a matter of perspective. and this bit too, my garden tends to look chaotic, but I think that is what nature looks like when she is working, we have become too used or conditioned to having tame gardens. What I tend to do is to look at a plant and consider what its life cycle might be if nobody interfered with it. And then I often let it get on with that life cycle and see how it fits in with obtaining a yield if that is possible. So, green plants may die in the winter or they may live. Many kales have lived (except winters that have been much harsher than our normal experience). Land cress, a not terribly significant plant is sold as an annual, but I have some in the garden that are two (possibly more) years old. They get larger each year and hotter as well, so I now cook the prolific leafy growth in later winter. Onion family plants generally have a way of getting through to the next year. Obviously normal onions are starch stores and they flower in the second year, but I did raise one from seed, a red variety that split rather than flowered. But I lost it in a bad winter. I had been hoping I would be able to perpetuate proper onions from it. Leeks will divide at the base if you leave that in the ground and make baby leeks the next year. I have had them returning for a couple of years but then they have died. Everything has a strategy for its future survival, either through seed production or some vegetative propagation. Conventional root crops like carrots, parsnips, beetroot will flower in the second year. I have kept some carrots for up to three years, but not tried eating them after the first year. I have cut them off an inch or two below the top of the carrot and replanted that part which usually regrows but I have used the resulting flowers to attract insects and also for seed production to start the cycle again. I am trying as many things as I can to see if I can get them to regrow properly but so far it is only scorzonera that I have been able to do this with. This is mainly because I don’t have a lot of time and space or success with growing more conventional vegetables! I haven’t got Patrick Whitefield’s book to hand tonight or I would check exactly what he says about pushing annuals to perennialise. I will have a look when I can. I would try whatever seems to be a sensible idea and fits in with how you want to grow and your conditions. If it doesn’t work you haven’t lost anything but you have gained more knowledge. Re Mike's comment about the work involved in growing things. There are different ways to grow and different amounts of work. Because my garden is so full of vegetables and other things there are (almost) no unwanted plants (weeds) which means no work at all during the summer months. The thing I am interested in is the amount of produce from the garden versus the hours of "work" put in and my experience is that I am happy with how that works out. I agree with the point about potatoes. They can be a plant / replant vegetable just like many others. I don't often use them as in the UK our wet summers mean potato blight. I did try this year and although it was dry for a good while at the start of the summer we then had a very, very wet period and all the spuds got blight in no time at all. To Dennis - I see what you mean, there is a lot of land to think about. I'm sure I'd feel really overwhelmed with that much! I think that Zach's advice is excellent - one step at a time, let nature lead where you can't / don't have the time or resources. Reading your description made me think of Sepp Holzer and how he manages a large area. I'm sure that you will evolve your own way of doing things.